© 2017 American Eagle Foundation, EAGLES.ORG. ...and visions of BIG FISH danced in their heads! Merry Christmas all! The kiddies are 3 weeks old. Big size difference between N18 & N19. Little N19 cowers every time N18 moves a muscle....even to stretch...lol, but I understand N19 has gotten in a few good bonks as payback. All calm in the nest today. All well fed. Soon, they will be best buds. Wishing everyone a wonderful holiday season. Chilly day at the nest....42 degrees. Juliet brought in a fish and relieved Romeo at the nest. She then served up brunch. N19 still cowers whenever N18 moves, but Mom filled up N18 first. Once N18 went into a food coma, N19 received a nice personal feed from Mom. Afterward, Juliet fluffed up the nest, covered the kids in moss, and the eaglets snuggled under her for a nap. 10:55am - Keeping warm under Mom. Courtesy of © 2017 American Eagle Foundation, EAGLES.ORG. M15 and Romeo must be nearby protecting their families. I'm sorry that it will not spawn now but I did not have time. Loza - poor Mom, she looks like a drowned rat in those pics. Brrrr... a very cold, damp, and windy day in the Hamlet. Temp is 37 degrees. Romeo is doing his best to shelter the kids and keep them warm as they squirm under him. Nice big fish in the pantry. 2:42 pm - One of the kids woke up. They are changing so fast. From chat : NE18 had quite a time swallowing a whole good sized fish tail, but got it all down! A whole fish! And it is still quite windy. One of the chicks has a whole fish in it's talon and is attempting to self feed right now!! Four weeks old and growing fast. I got some nice close-ups today. There was a mild mannered bonk or two, but not during meals and only when someone's wing or body movement disturbed the other sibling. These two really like to cuddle. So sweet. Late in the afternoon, the kids were alone while Juliet went hunting. She returned with a fish and served up dinner. Once the kids were full, she fluffed up the nest, tucked in the kids with moss, and then flew off. It appears she had a spa appointment, like any mom deserves. When she returned, she was all wet and puffed up with drooping wings to dry off after a good bath. I love how she made sure the kids were taken care of before she did this. 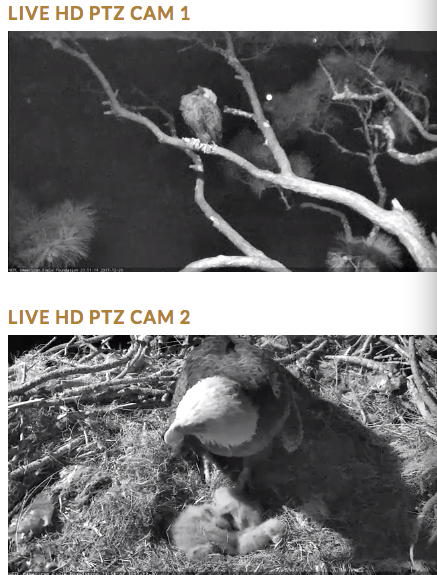 N18 has huge feet in comparison to N19, and I wonder if the older eaglet is a girl. They are adorable. 529pm - N19 (left) and N18. 555pm - Sibling love, N18 (left) and N19. NE18 is "Sky" and NE19 is "Spirit"!